China has carried out a test flight of an unmanned aerial vehicle (UAV), or drone, that could provide rapid cargo delivery to remote islets in the South China Sea without airstrips, a report by Xinhua news agency said. 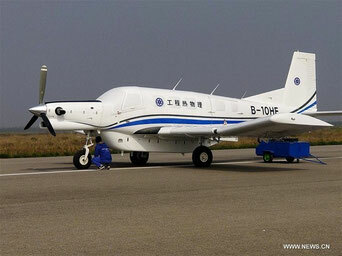 The new AT200 cargo drone, which is based on a PAC P-750 XSTOL turboprop aircraft, built by the New Zealand plane manufacturer Pacific Aerospace, conducted its first flight successfully in Pucheng County, northwestern China’s Shaanxi Province last week. Chinese AT200 drone aircraft is based on New Zealand's PAC750 XStol. Pacific Aerospace last year signed a joint venture agreement with the Beijing General Aviation Company (BGAC), a subsidiary of the Beijing Automotive group. The joint venture, called Beijing Pan-Pacific Aerospace Technology (BPAT), opened a state of the art aircraft manufacturing plant on a 10 hectare site at Changzhou Airport on October 21, 2016. On the occasion, BPAT said it expected to roll out up to 100 Pacific Aerospace light aircraft a year from the new plant. The AT200 cargo drone has been developed by the Institute of Engineering Thermophysics (IET) of the Chinese Academy of Sciences (CAS) and other institutes and has a maximum take-off weight of around 3.4 tonnes and a payload of 1.5 tonnes. According to a statement by IET, the aircraft could be one of the world’s most powerful civilian UAVs. The UAV has a maximum speed of 313 km per hour, a flight range of 2,183 kilometers and a 6,098-meter service ceiling. Taking off and landing can be automatically completed within 200 meters. According to the institute, the new drone could be used to conduct freight transport in mountainous regions and on islands. According to Chen Xiang, director of unmanned aircraft vehicle guidance at Aviation Industry Corp of China’s Xi’an Flight Automatic Control Research Institute, the current development is carried out for SF Express, the second largest courier service in China after State-owned China Post. He noted that the drones currently in service or under development are all small and could not compete with the large Chinese drone in speed and carrying capacity. “The reason we lead in this field is that China is leading in e-commerce and thus has a bigger demand for such drones than others,” he explained. An earlier report in the China Daily quoted the AVIC Xi’an institute as saying that the cargo drone first will be used for technological demonstrations and the civil aviation authorities’ certification process and then will be put into commercial operation. AVIC Xi'an Institute Chen Xiang also said that compared with manned freighters, the operational costs of freight drones will be about 30% less. The drone will be used for short-haul deliveries of time-sensitive goods such as fresh food and medical supplies. “Next, we will focus on how to improve the drone’s safety, reliability and intelligence. Future models will also be based on utility aircraft with a takeoff weight of 3 to 5 tonnes and will likely be capable of conducting an automated takeoff, cruising flight and landing with no manual manipulation,” he said. Yang Chao, a senior aircraft designer at the aeronautical science and engineering school at Beihang University in Beijing, was quoted by the South China Morning Post as saying that China had been converting planes into drones since the 1950s. Yang, who was not involved in the AT200 project, said the South China Sea would be an ideal testing ground for the cargo drone given the lack of air traffic to the remote islets – meaning there would be less of a technical challenge or safety risk. China lays claim to 90% of the South China Sea, despite an international tribunal ruling invalidating its claim last year and the SCMP report said that the cargo drone project is part of Beijing’s efforts to boost its presence in the area.